Go2Album is a free online photo gallery dedicated to Photo Slideshow Maker users. Photo Slideshow Maker helps you create gorgeous photo flash slideshows with music and transition effects, and lots of beautifully-designed flash templates. You can publish the photo slideshows to our free web album hosting service Go2Album. 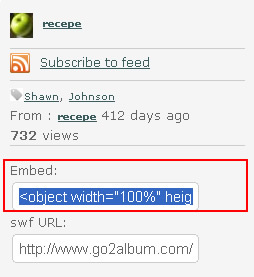 After uploading the Flash slideshow to Go2Album, you can then easily embed it to other websites. What's more, you can then embed the uploaded Flash slideshow to MySpace, Blogger, Live Space, WordPress, LiveJournal, and all social websites and blogs that support editing HTML code. To create photo slideshows that can be upload to Go2Album, you need to download and install Photo Slideshow Maker. To publish PFM-created slideshows to Go2Album, you need to sign up for Go2Album service. When you proceed to the last step of creating slideshow with Photo Slideshow Maker, select the "Create Flash File and Upload to Go2Album", and the Flash slideshow will automatically uploaded to Go2Album. Now you get the source code. Just open the webpage, and paste the code to where you want to display the Flash slideshow. You can insert your flash slideshow to eBay as product descriptions, or to Social Networks such as MySpace, WordPress, Blogger, hi5, iGoogle, myYearbook and so on.